A dazzling synthetic diamond drop necklace featuring round brilliant diamonds in graduated sizes, bezel set on a 16", 18" or 20" chain. Available options: platinum, 14k or 18k gold: white, yellow, rose. Customize yours with fancy pink or fancy blue diamonds. Learn more about Ada Diamonds custom jewelry design process and sustainable, conflict-free diamonds. Ada Diamonds Design Description- This graceful drop necklace features three bezel set lab grown diamonds in graduated sizes, in 14k white, yellow or rose gold, on a 16", 18" or 20" chain. Makes a great gift for a mother of three children, or a perfect gift for a third anniversary. 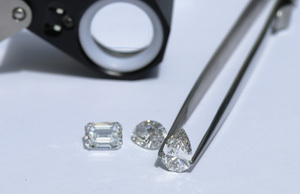 Starting at pricing assumes a GH, VS lab grown diamonds set in 14kt white, yellow, or rose gold. Additional setting fees for 18kt: $150, for platinum: $300.